Freshly cut grass, saltwater, and sunscreen are just a few of the scents of summer. Even better than the scents, though, are tastes. When I’m on the beach, I like to enjoy a tall glass of freshly squeezed lemonade. Even if you don’t have a chance to lounge around in the sun, you can get a taste of the season with a few citrus inspired crafts. 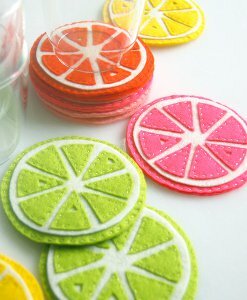 The Summer Citrus Coasters pictured at left are must-haves for your next picnic or pool party. 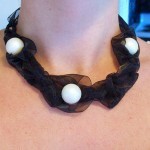 This easy sewing pattern is fun and functional. 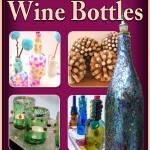 Plus, the bold colors will help your guests remember which drink belongs to whom. Or, check out the Floral Ball, is an explosion of reds, greens, and yellows that makes a beautiful centerpiece, whether your gathering is indoors or out. If you have a hammock hanging in your backyard, the Citrus Burst Pillow will make those afternoon naps extra cozy. When folks think of the word “citrus,” the first fruit that pops into mind is the orange. This bold color lacks subtlety, so if you’re hoping to draw some attention, orange is the way to go. 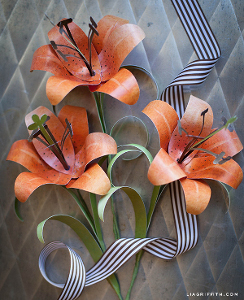 Dazzling Orange Tiger Lily – It doesn’t get much easier than this DIY paper flower craft, because the cute freckled petals are printable. Orange Crochet Tank for Tot – The best part about this cute crochet top is the black and white ribbon that ties at the slit in the back. 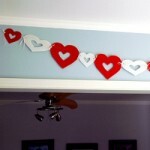 Rustic Orange Peel Garland – You’d be hard pressed to find a DIY garland that smells as sweet as this one. There’s a reason I reach for lemonade during those hot summer afternoons. Lemons are so refreshing! These crafts smell as delightful as they look. 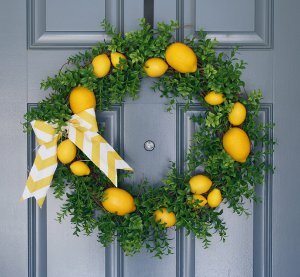 Lovely Lemon Wreath – This DIY wreath will greet all of your guests with a hint of lemony freshness. Lemon Candles – You can make these quirky handmade candles and give them as favors at your next party. Lemon Sugar Scrub – Keep hands soft and smooth with a yummy sugar scrub. Kids can help, too! Now we’ve come to my favorite shade of citrus: lime green. 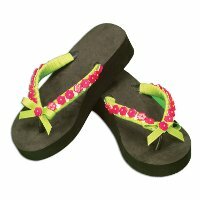 It’s hard to keep frowning when you come across a craft in this bright color. Groovy Green T Shirt Tote – Designed with the environmentally-friendly in mind, this DIY bag is made from recycled and earth-safe materials. Wicked Lime Green Backpack – There’s something sassy about this crochet backpack. I love the fringe at the bottom. Scrappy Rag Wreath – Vary your fabric scraps to make this DIY wreath super cute. Just like Danny and Sandy in “Grease,” I’ve been thinking a lot about those summer nights lately. It has been cold! We had the coldest 4th of July in 30 years in Chicago, and I was definitely not prepared. I hate buying jackets especially for summer because it is such a short season, so I end up being cold and jacketless from June to August. 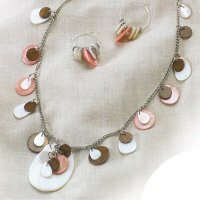 After looking at some of our newest craft projects, I’ve realized the solution is to make something I can wear year-round. Yes, I said make! I am always looking for a weekend rainy day activity so this would be perfect. 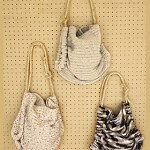 Here are three of my favorite new crochet and knitting projects from FaveCrafts.com. Which one should I make? Long Lace Stole: This one is thick enough to be a winter scarf but wide enough that it would make the perfect shawl for a cold summer night. The yarn is colorful so the pattern looks fairly easy. Chunky Knit Long Wrap: This is a more dressed up wrap that could really complete an outfit for a casual night out at the movies or a fancy dinner. I actually love the burgundy yarn featured in the photo, but this one looks a bit more time consuming because of its size. 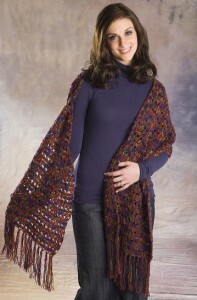 Quick and Easy Shawl: This is a smaller shawl that would probably be paired better with a dress or a light sweater in the fall or winter. 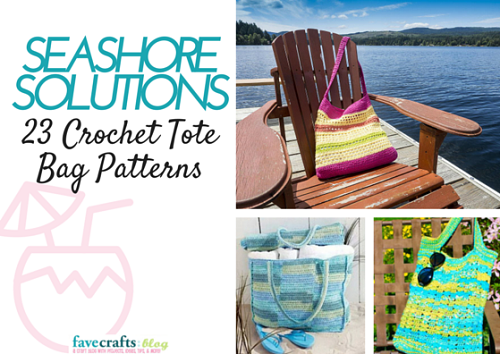 I love how easy this pattern is–I think even I can do this one!